Here’s a recipe for making creamy and cheesy béchamel without the cream and cheese to use as a healthy alternative for cream sauces full of fats and calories. This multitasking white sauce can be served over pasta, sautéed vegetables, chicken steak or even with nachos. RecipeSavants.com Here’s a recipe for making creamy and cheesy béchamel without the cream and cheese to use as a healthy alternative for cream sauces full of fats and calories. 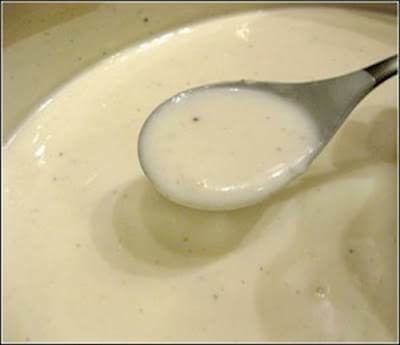 This multitasking white sauce can be served over pasta, sautéed vegetables, chicken steak or even with nachos. Smart Recipes, American Recipes, Dairy Recipes, Recipes Dairy American Bechamel Sauce PT13M Serves 2 Ingredients: 4 Tablespoons Butter 3 Tablespoons Flour 1.5 Cups Milk 0.125 Teaspoon Paprika 0.125 Teaspoon Nutmeg 0 To Taste Salt & Pepper Heat a nonstick saucepan on low and melt butter in it. Add flour and mix. Now, slowly pour in milk and cook with constant stirring until thick and creamy, about 5 minutes. Season to your liking.